Evolutionary models are iterative type models. They allow to develop more complete versions of the software. Following are the evolutionary process models. 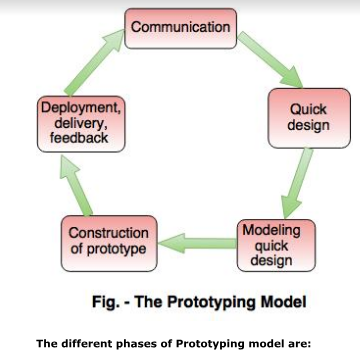 Prototype model is a set of general objectives for software. In this model, working programs are quickly produced. Communication In this phase, developer and customer meet and discuss the overall objectives of the software. Quick design is implemented when requirements are known. It includes only the important aspects like input and output format of the software. It focuses on those aspects which are visible to the user rather than the detailed plan. It helps to construct a prototype. This phase gives the clear idea about the development of software because the software is now built. It allows the developer to better understand the exact requirements. The prototype is evaluated by the customer itself. If the user is not satisfied with current prototype then it refines according to the requirements of the user. The process of refining the prototype is repeated until all the requirements of users are met. When the users are satisfied with the developed prototype then the system is developed on the basis of final prototype. Prototype model need not know the detailed input, output, processes, adaptability of operating system and full machine interaction. In the development process of this model users are actively involved. The development process is the best platform to understand the system by the user. Errors are detected much earlier. Gives quick user feedback for better solutions. It identifies the missing functionality easily. It also identifies the confusing or difficult functions. The client involvement is more and it is not always considered by the developer. Many changes can disturb the rhythm of the development team. It is a thrown away prototype when the users are confused with it. 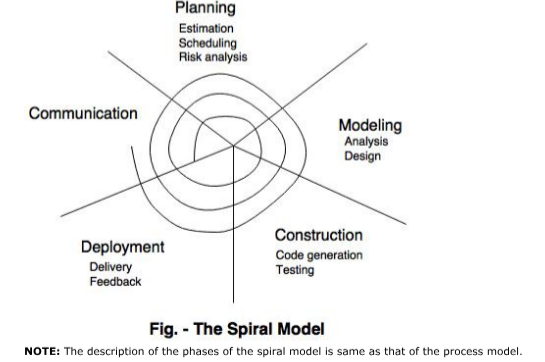 Spiral model is a risk driven process model. It is used for generating the software projects. It is a combination of prototype and sequential model or waterfall model. In one iteration all activities are done, for large project's the output is small. The framework activities of the spiral model are as shown in the following figure. It reduces high amount of risk. It is good for large and critical projects. It gives strong approval and documentation control. In spiral model, the software is produced early in the life cycle process. It is not used for small projects.